Edelbrock Fuel Rail UNIVERSAL - MiataRoadster - Stay tuned with MiataRoadster! Designed for stock or Edelbrock manifolds, these Fuel Rails are fully CNC machined from aluminum extrusions, polished then hard anodized for use with racing fuels (including methanol). The 5/8” i.d. fuel passage features a flow-through design with –8 AN O-ring threads on both ends. 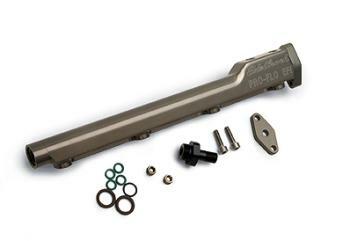 These Edelbrock Fuel Rails include a fuel regulator mounting at the end of the rail that can be used with stock or aftermarket regulators and two auxiliary 1/8” NPT ports for pressure gauge, nitrous system fuel supply, etc. Secondary Fuel Rails are fully CNC machined from aluminum extrusions, polished then hard anodized.